[Editors Note – Sometimes someone forgets to refill the coffee pot at HubPages Central, and our senses get so dulled that we need to call on a guest contributor to write our blog…it gets all really stressed-out. Valentine’s day only comes once a year, and once a year, HubPages let’s yours truly, Cupid, write a post about how to keep that hunk a’ love burnin’-burnin’. So sit back baby, turn off the lights and light a candle. 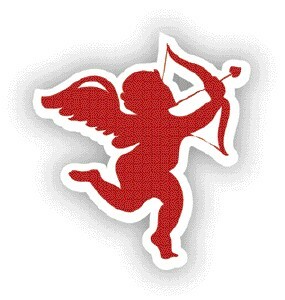 Cupid’s gonna show you how it’s done right…. Times is tough, but that’s no reason not to show that special someone all the love you got. Maybe you’ve been procrastinating or maybe you’re trying to still trying figure out how to express yourself to your lady or fella. Maybe you ain’t been hit by Cupid’s Arrow yet, or maybe you just been left behind a mean mistreater. Either way baby, I know you’ll be back in the game…I invented the game! Like I say: ain’t nothing to it baby! Love the one you’re with, or find someone to love. Either way, I’ll see y’all next year. Be good now. Yah! The Valentine day. People really waits for this day. I see that already published some of the hubs based on the Valentine day. I missed the idea to publish at least one hub based on Valentine day. But I am not hopeless. I have a great wish to write some hubs in the next year’s valentine day. Thanks for the love tips. Next year I’ll write a story on cupid’s arrow. Valentine’s Day is a day or reprieve for those who have difficulty showing affection and devotion the rest of the year. You really do not see hordes of women rushing around last minute for roses and chocolates or theatre tickets or making dinner reservations. Women do not have as much of a problem in the displayed affection category the rest of the year.